November 14, 2018 9:31 pm. 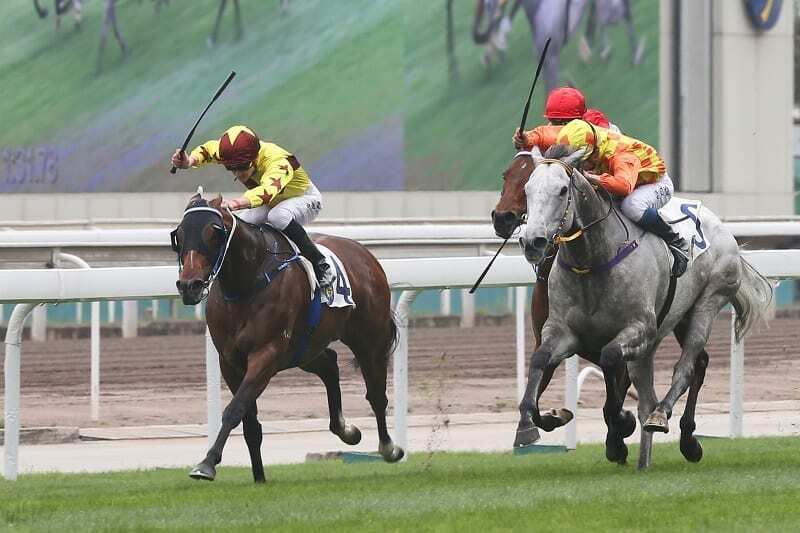 Southern Legend (inside) gets the better of Pingwu Spark last season. Source: Hong Kong Jockey Club. Trainer Caspar Fownes is confident his Group 1 miler Southern Legend is ready to turn around an indifferent start to the season in Sunday’s (18 November) G2 BOCHK Wealth Management Jockey Club Mile (1600m) at Sha Tin. “I’d be disappointed if he didn’t finish in the first three. His coat’s come good, in fact it’s immaculate now after he just wasn’t quite there for his two runs this time around. You’d swear he thinks he’s in Australia and coming into summer because that’s how well he’s done over the past couple of weeks,” Fownes said. Jockey Douglas Whyte described last season’s Singapore G1 Kranji Mile (1600m) winner as finishing ‘one paced’ at his second run this term when five lengths eighth to Beauty Generation in the G3 Celebration Cup Handicap (1400m) at Sha Tin on 1 October but Fownes insists the horse has trained on and will be better placed at Sunday’s longer trip. “He’s generally had a good prep and has improved since his last run. He looks a treat now and gets his chance at the mile. We’ll have him there on Sunday in great order with just a hint of improvement left for the big day,” he said in reference to the Hong Kong Mile on 9 December. Southern Legend is not yet an unconditional Group 1 winner – his Singapore success was designated a local G1 – and thus has no 5lb penalty on Sunday but he has established his bona fides at the level via his length and three-quarter third to Beauty Generation in the Champions Mile and a one-length fourth to Season’s Bloom in the Stewards’ Cup earlier this year. Those performances are two of his only three starts at the course and distance – with the other being a short-head victory over Pingwu Spark in a Class 1 handicap in March. That came two months before his Singapore success, after which the G1 LONGINES Hong Kong Mile was immediately declared his target. It was Fownes’ fourth victory in Singapore having won the International Sprint there with Green Birdie in 2010 and Lucky Nine in 2013 and 2014. Sunday’s fixture has also been kind to Fownes with the Jockey Club Mile success of The Duke in 2004; Jockey Club Cup wins with Thumbs Up (2011) and Military Attack (2015), and the evergreen Lucky Nine winning the Jockey Club Sprint in 2012.